Wow. 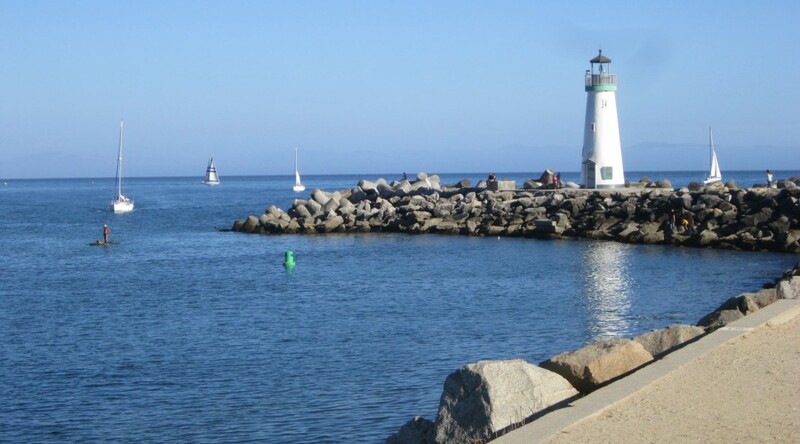 My first full day at home in Santa Cruz, CA, the first thing that I noticed was the quiet. Compared to the bell-clanging, horn-honking, engine-sputtering, brake-squealing hustle-bustle of Kolkata’s 4.5 million human residents, plus umpteen million cars, motorcycles, auto-rickshaws, crows, dogs, cats, goats, and squirrels, Santa Cruz (pop. about 63,000) is practically a ghost town. This afternoon, just a few waves are lapping the sand at Seabright Beach, and if I listen really closely, I can hear the barking of a couple of the sea lions hanging out underneath the Santa Cruz Wharf, more than a mile away. At the end of next month, after Memorial Day, the tourists will take over. 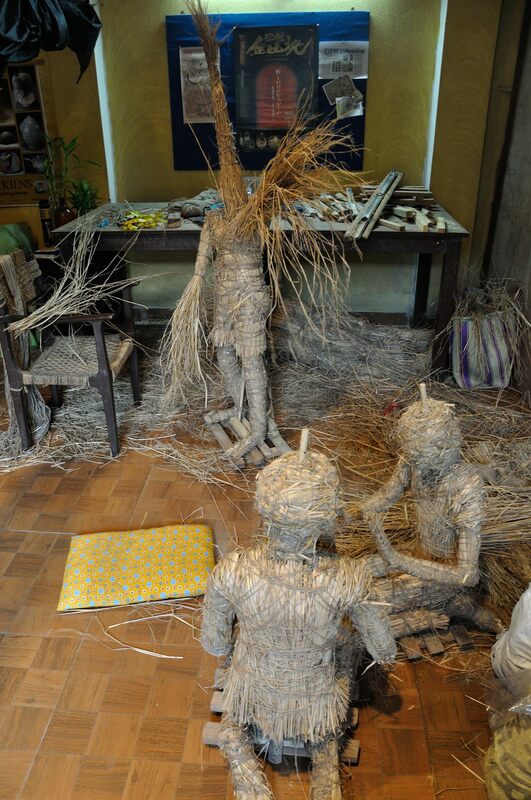 Even then the resulting increase in busyness could never be compared to the likes of Kolkata. Two weeks before I left, as I was desperately searching for packaging materials, I also started to emotionally process that I would be leaving Kolkata after being there for the better part of seven months. A great part of me couldn’t wait to come home!! Yet, I knew that as soon as I arrived home, another, equal, part of me would be missing Kolkata. There are the obvious things that I welcome about being home — my husband, cats, garden, studio, being able to bite into an apple without peeling it first, and eating raw, leafy green salads without a detailed, rigorous rinsing regimen. And having my truck there for me to drive, wherever, whenever. 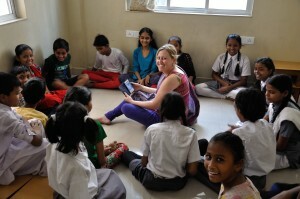 This was my fifth visit to India. The first three relatively short visits were as a tourist, during the late 80’s – late 90’s. 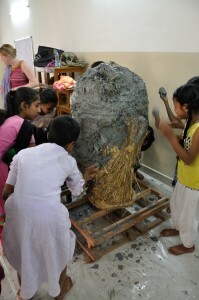 The fourth visit was as an artist-in-residence at Sanskriti Kendra in 2011, plus a little traveling. This time was very different. In seven months, I made many friends and developed a rhythm of living life there which made leaving so bittersweet. 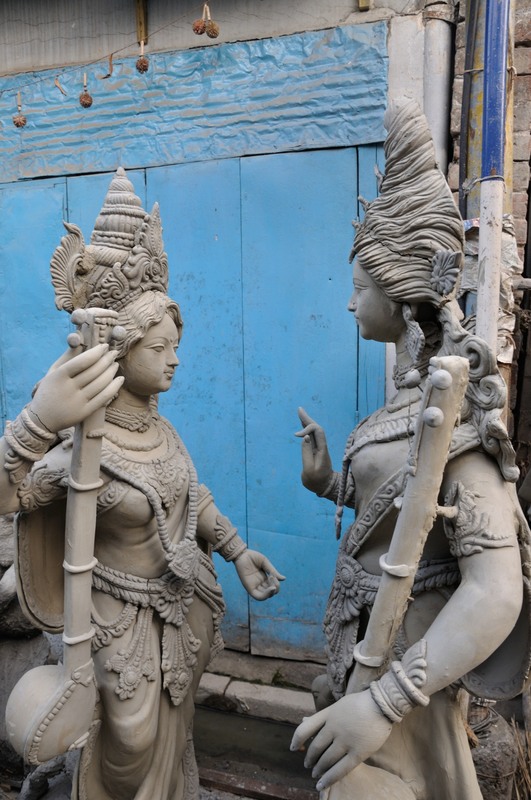 There’s so much to miss about Kolkata and its vibrant, teeming culture — rather than listing it all, I prefer to resolve to return in the future. And I will. Meanwhile, I’m back and there’s so much to do! 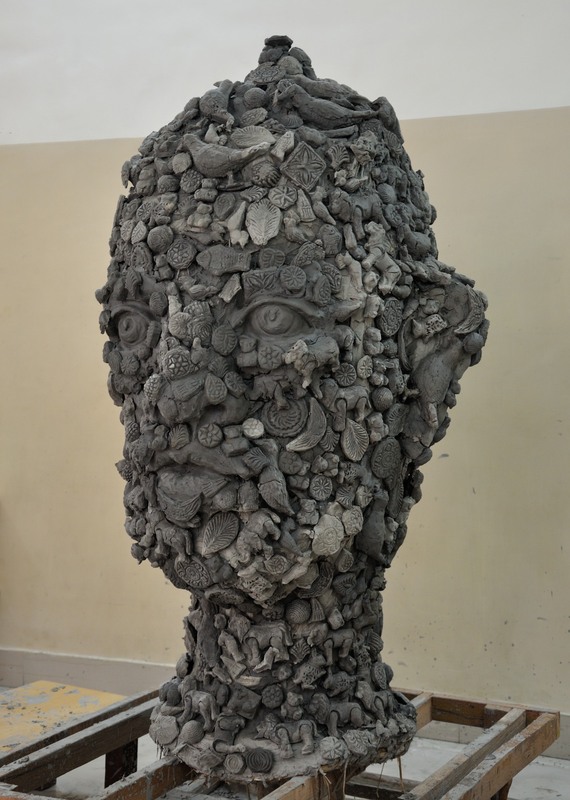 Besides the post-grant Fulbright paperwork and the ever-present house and garden projects, what I’m looking forward to the most is diving back into the studio and integrating all of these incredibly rich experiences into my work, both permanent and temporary. 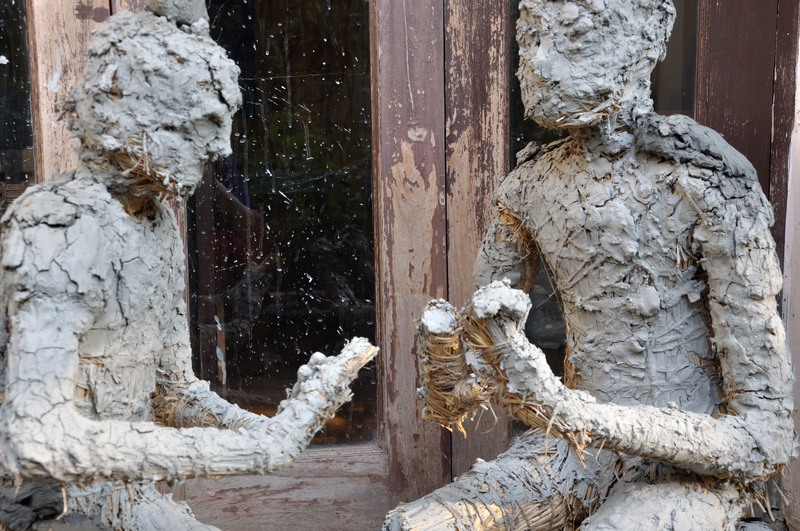 My experiences with Elements and Ek Tara have motivated me to seek more partners for collaborative works. Any ideas? Please contact me at cynthiasiegel@msn.com. 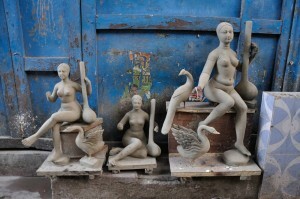 And check back soon, as I evolve this blog to share how the work begun in Kolkata takes its shape in the USA. 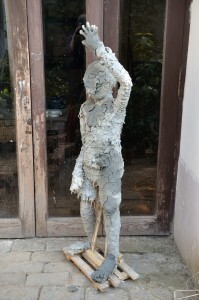 My work on the Elements project really whetted my appetite for more exploration in creating temporary, collaborative sculpture in which the viewer’s participation becomes an integral part of the work. 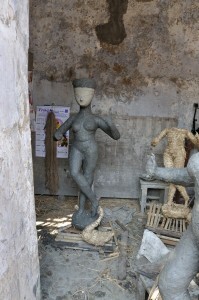 I began developing ideas for new projects while observing preparations at Kumartuli for Saraswati Puja. Then after returning from my trip to Molela and Nathdwara, I searched Kolkata for potential venues and partners. 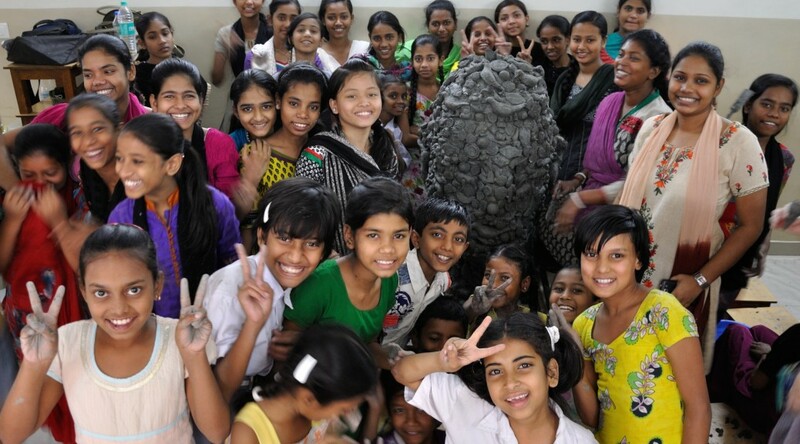 Curator and social entrepreneur Nandita Palchoudhuri connected me with charitable organization Ek Tara, located in the Kolkata neighborhood of Topsia. Thanks Nandita!!! Ek Tara provides opportunities for education and vocational training for more than 500 children and women who reside in the Topsia and Tiljala area. For our March 2015 project together, I created a four foot tall head in straw and bamboo. 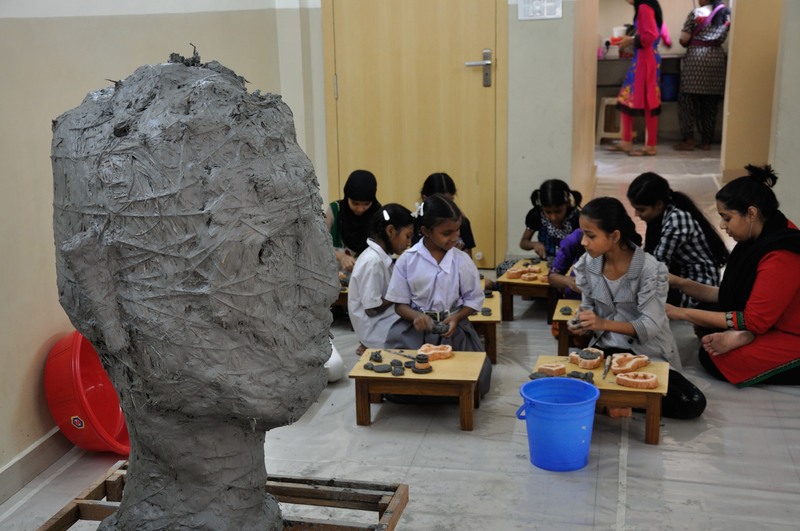 In an exciting two-day workshop, fifty Ek Tara students gleefully and tenderly covered the large head form with imagery in clay. Working with fifty children on a project takes tremendous organization! 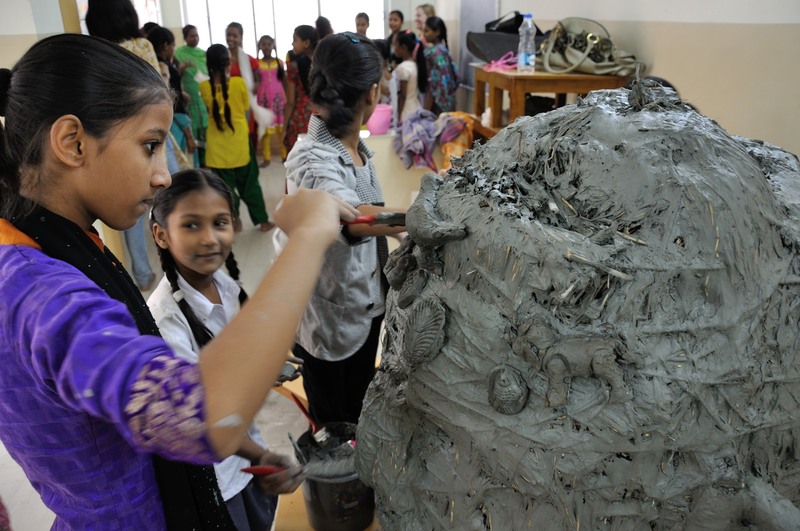 Not only were the wonderful Ek Tara instructors and helpers on hand to smooth the process, but Fulbright-Nehru Student Scholar Julie Schofield‘s assistance was invaluable to me, as she entertained the children who were waiting to take their turn in working on the sculpture. The sculpture’s title, Lucky Indian Forest, comes from the children. 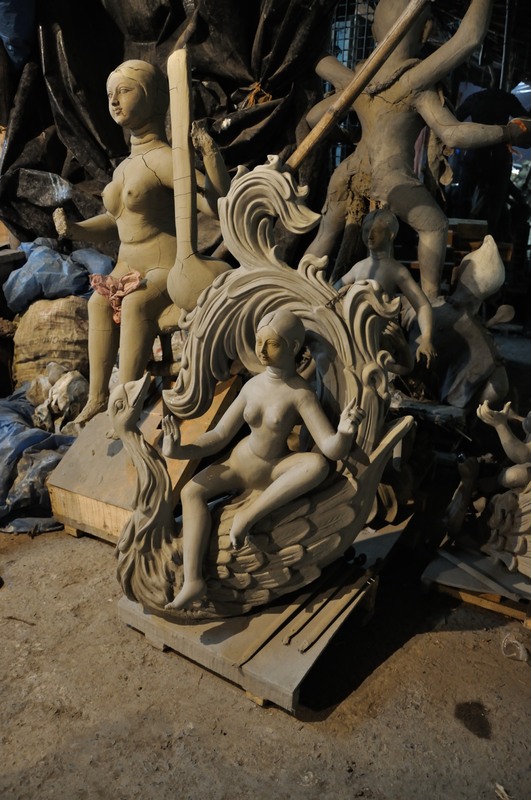 They had been asked to bring forth ideas for a title as they worked to build up the image-laden surface of animal figures and traditional designs, using clay press molds I created for them, and traditional sandesh molds from Kalighat. What a great project! 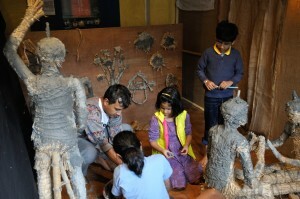 Children and adults alike were enthusiastic and happy. The camaraderie was fantastic. I hope to do many more projects like this one. 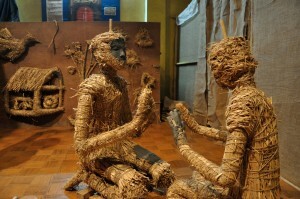 Children covering the straw and bamboo head with clay imagery. 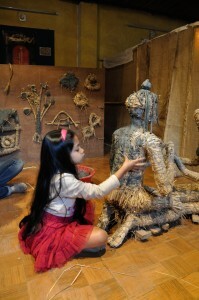 “Lucky Indian Forest” at Gallery Sanskriti in April 2015. 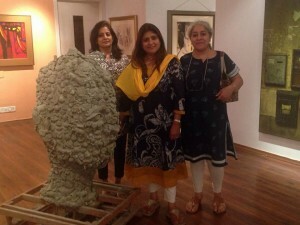 Ambica Beri, gallerist, in center, Anita Kanoi, Ek Tara trustee, on right. Saraswati is the goddess of knowledge, music and art, and is the daughter of Lord Shiva and Ma Durga. 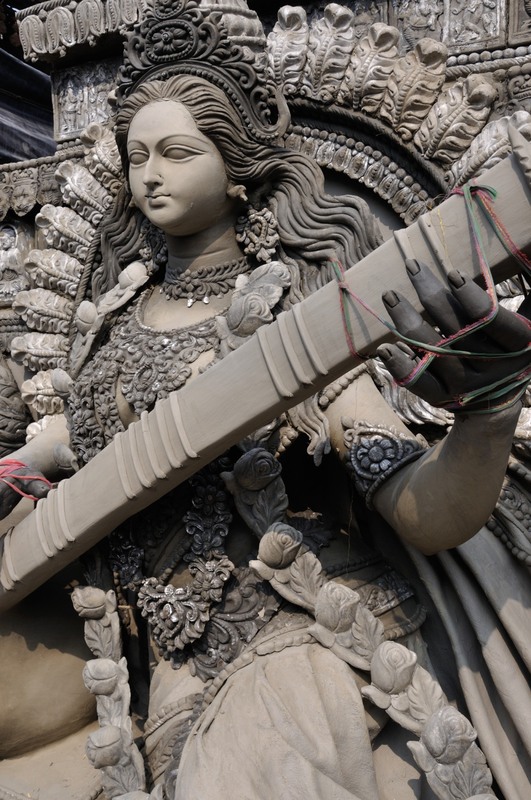 In West Bengal, Saraswati is revered by schools and universities, because of the belief that she endows the worshipper with speech, wisdom and learning. 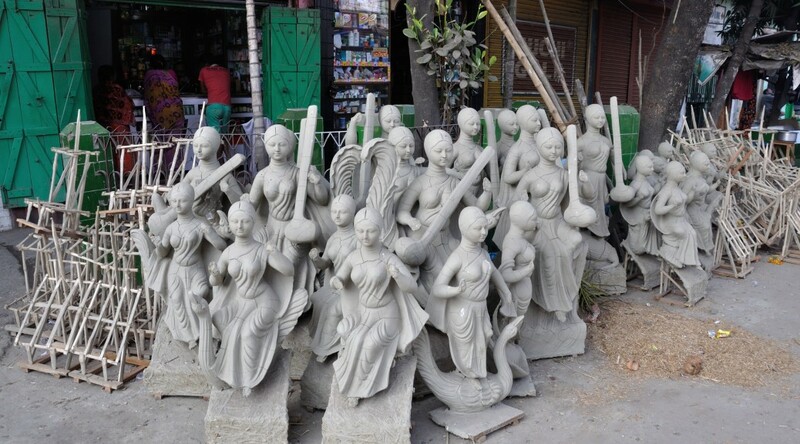 Saraswati Puja takes place this year in later January, so preparations of clay images at Kumartuli began in late December. 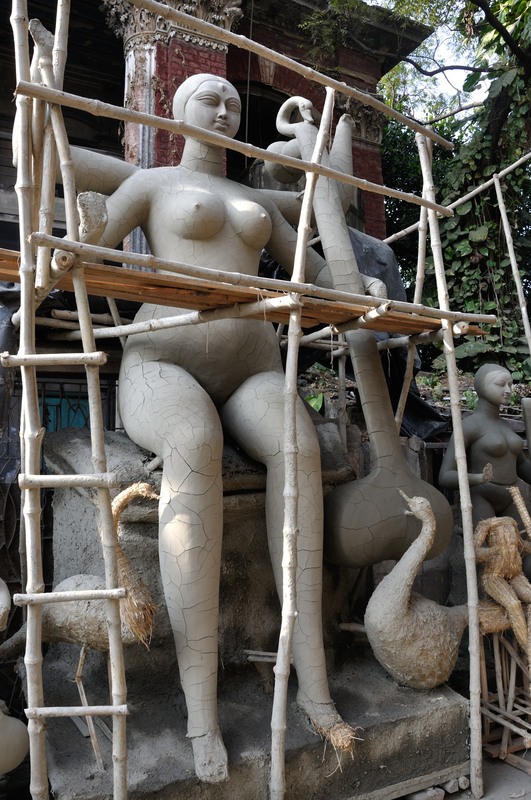 The energy at Kumartuli is much quieter than the frenzied activity of Durga Puja preparations, but there were a group of artisans in the neighborhood who were making some spectacular images! This image is 10-12 feet tall. This image is about 14 feet tall. 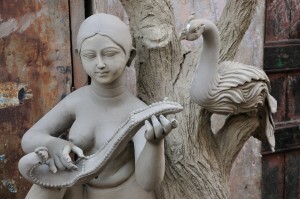 Saraswati is either accompanied by or seated on a swan, and is dressed in white for purity. 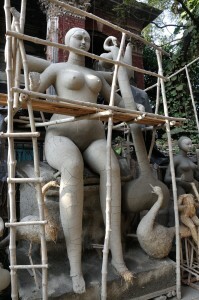 In the images made at Kumartuli, she is mostly depicted with two hands that play a stringed instrument called the veena. 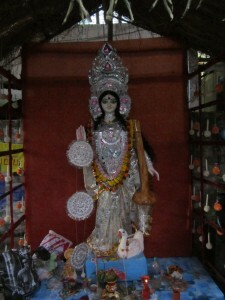 In the images where she has four hands, the other two hands will hold a rosary and a book. 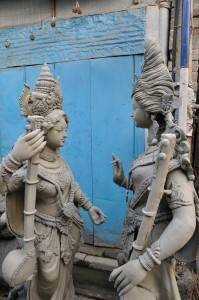 Pair of life sized Saraswati figures placed as if conversing. 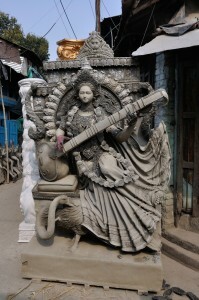 Saraswati is also a prominent figure in Buddhist iconography – the consort of Manjushri. 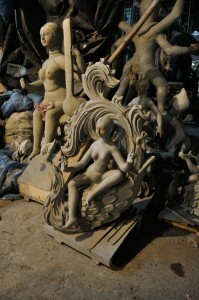 Her early history is as a river goddess, and I saw a number of figures adorned with flowing, watery imagery. 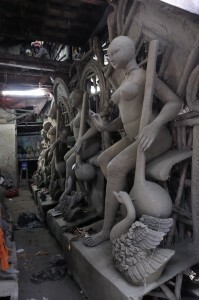 Dilip Pal and his assistants were working on eleven commissioned Saraswati images during this time, ranging from two to four feet tall. 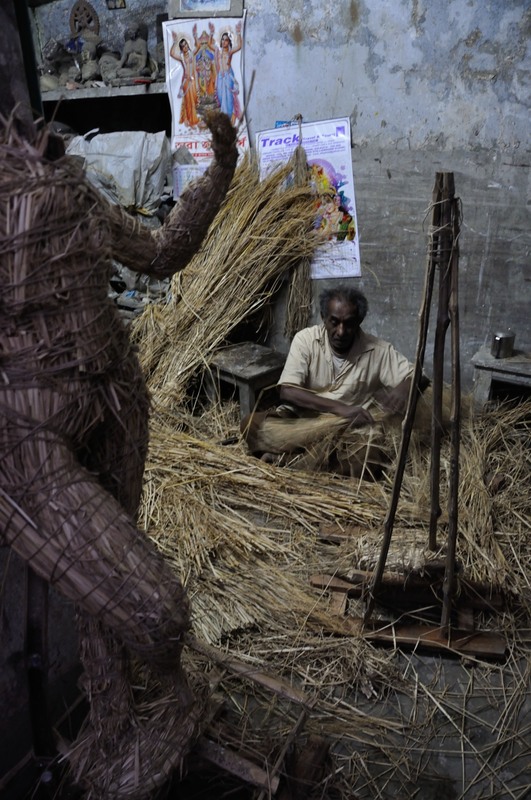 The floor of Dilipda’s studio at the Shovabazar Rajbari was blanketed with straw, as assistant Netal Pal bent and wrapped and compressed the straw into voluptuous female forms. Small Saraswati pandal in the Kumartuli neighborhood. 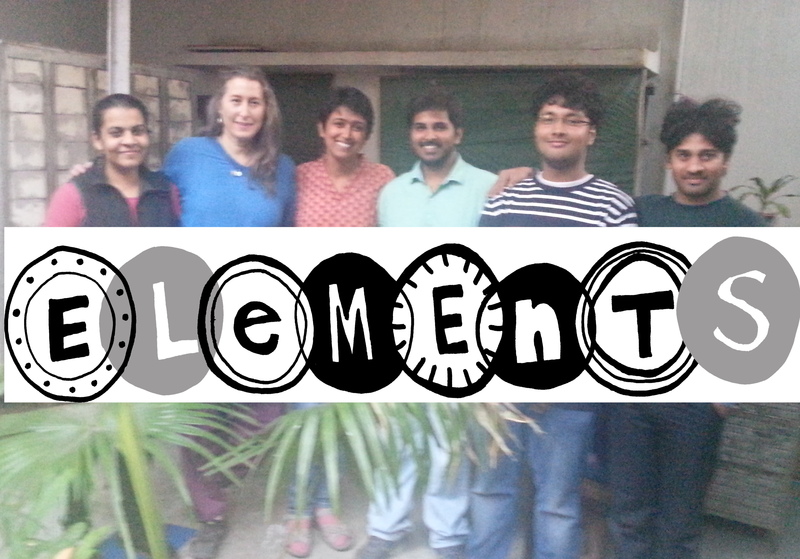 In December I was very busy with a project called ELEMENTS. 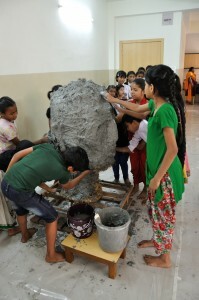 ELEMENTS was an experimental art installation for children in Kolkata, the first of its kind in India, and for the kids it was a thrilling sensory experience. Created by Ruchira Das of ThinkArts, this multimedia project melded puppetry, motion-activated laser and sound, and clay. 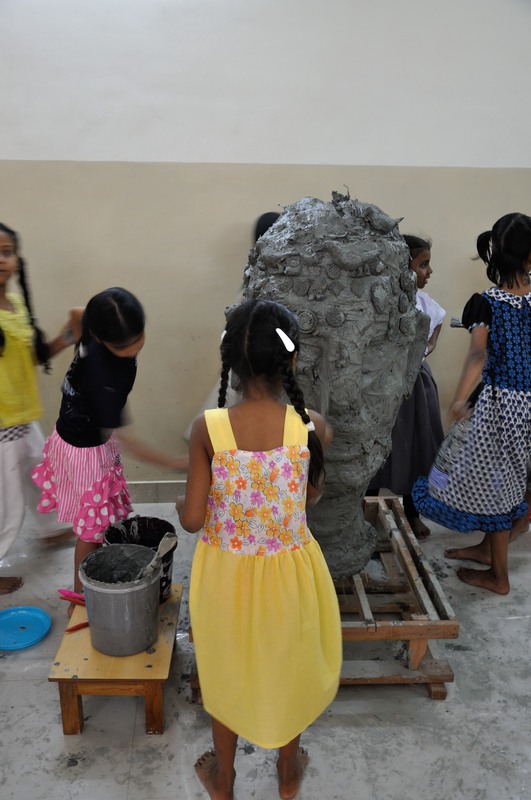 When I met Ruchira, she knew that she wanted to include clay in the project, but was still looking for ideas of what to do and for an artist to make it happen. 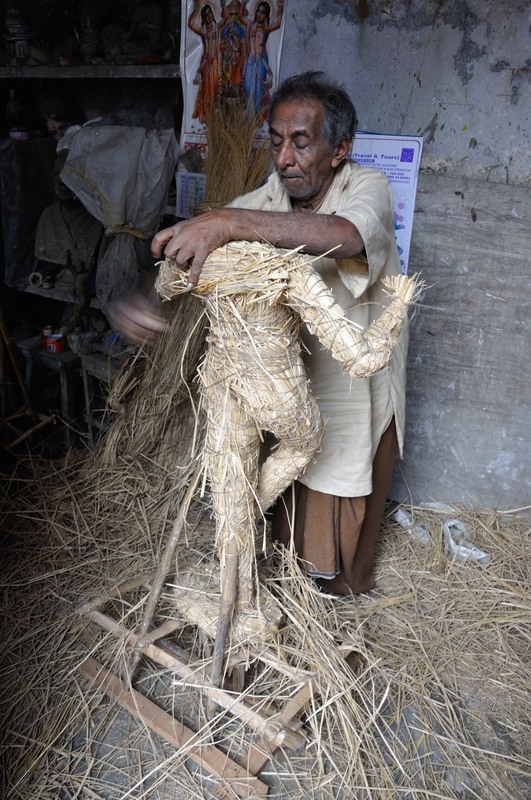 After my months of observing the processes at Kumartuli, the maker in me leapt into action and I suggested that we draw upon Kumartuli for inspiration and create straw figures for the children to cover with clay. 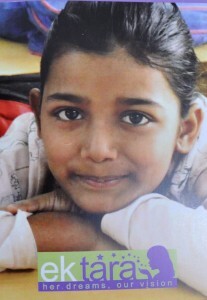 Ruchira agreed, and I happily became part of the project. 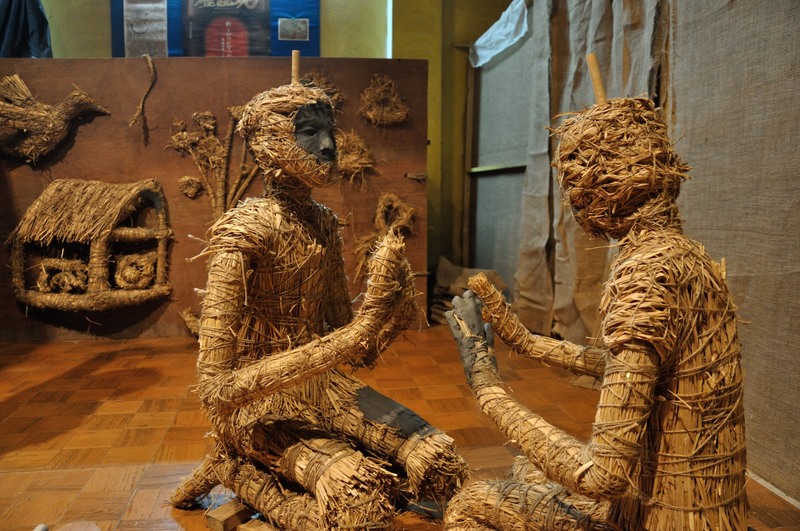 I decided that these straw, jute, and bamboo figures would be life-sized children; my reasoning was that I wanted the children to be able to relate directly to the forms as reflections of themselves. 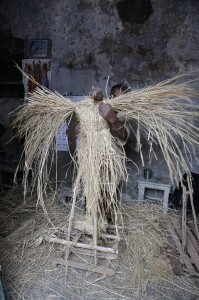 Working in straw is seriously fun! And the camaraderie of our diverse group made the experience even more enjoyable. Here are the figures the night before the installation opened, with just a hint of clay to get the children started. The children at play, more than 150 kids participated! And by the end of the event, the figures were transformed. 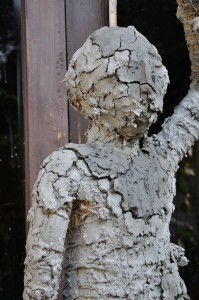 For me there’s a poetry to these cracking layers of clay, unselfconsciously (maybe even gleefully?) 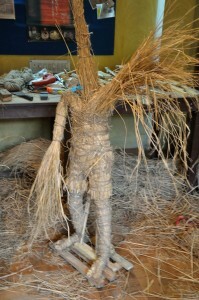 slathered onto the straw forms. I love them. 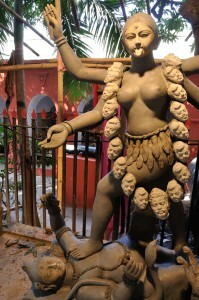 I prefer Kali to Durga. Why? Since I’m not exactly sure, I thought I’d use the writing of this post to help figure it out. 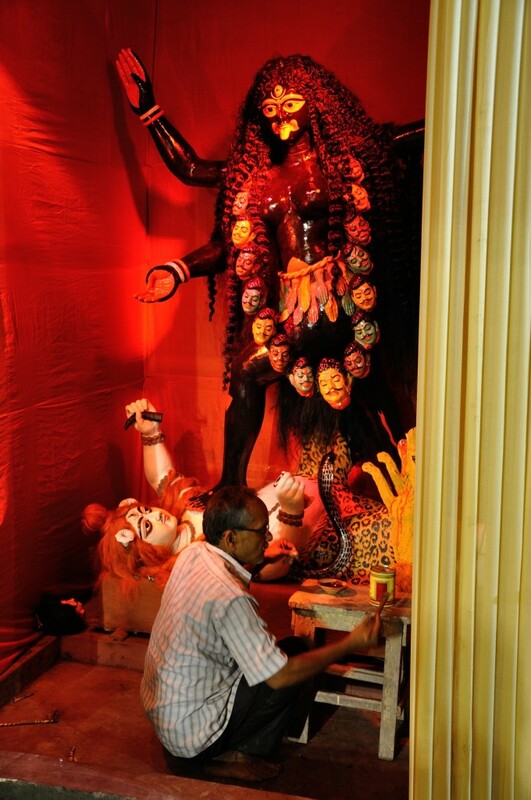 In Kolkata, Kali certainly has less fanfare than the almighty Durga, but from my vantage point, Kali’s devotees appear to have as much or maybe even more fervor for their goddess. 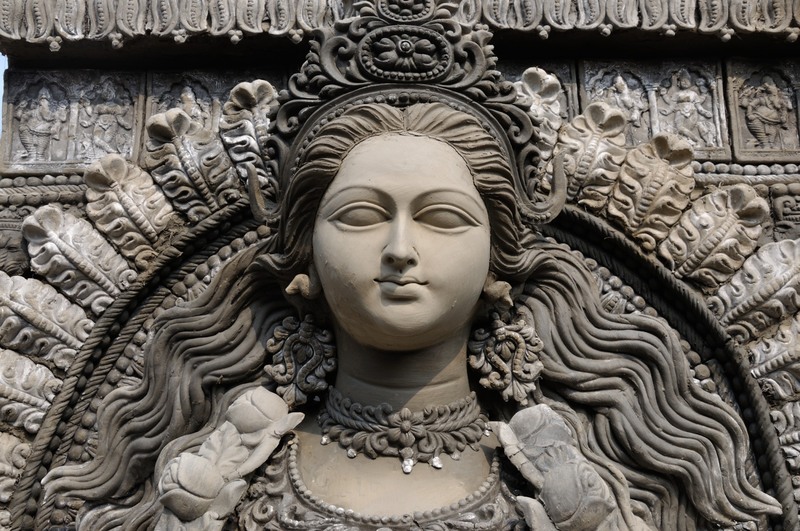 While Durga is considered to be the goddess of supreme power, Kali is thought of as the goddess of empowerment. 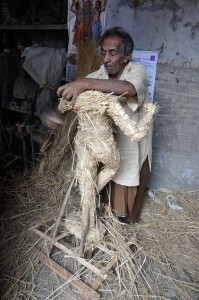 That strikes a chord in me – copacetic to what I feel and think when making my figurative sculpture in Santa Cruz. 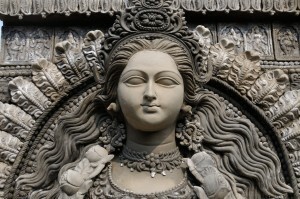 Kali fascinates me — consider her lolling tongue, that rhythmically wonderful strand of severed, grimacing heads around her neck, and her very active gesture of stomping on her consort Lord Shiva (other interpretations are that of accidentally doing so, and also that her foot on his body calms her anger). 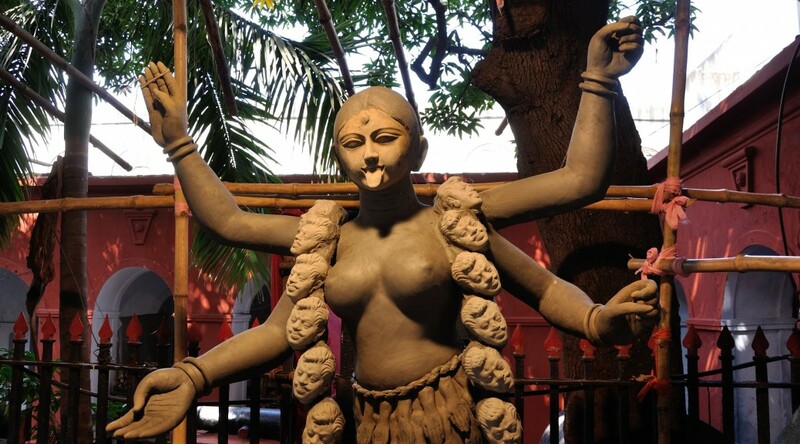 Regarding Durga, even with all ten of her hands loaded with weapons, it always appears to me that her lion is doing, well, the lion’s share of the work (sic) when it comes to battling Mahishasura. 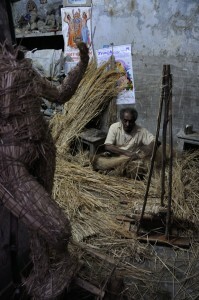 Dilipda and his assistants began their Kali in Dilipda’s studio. 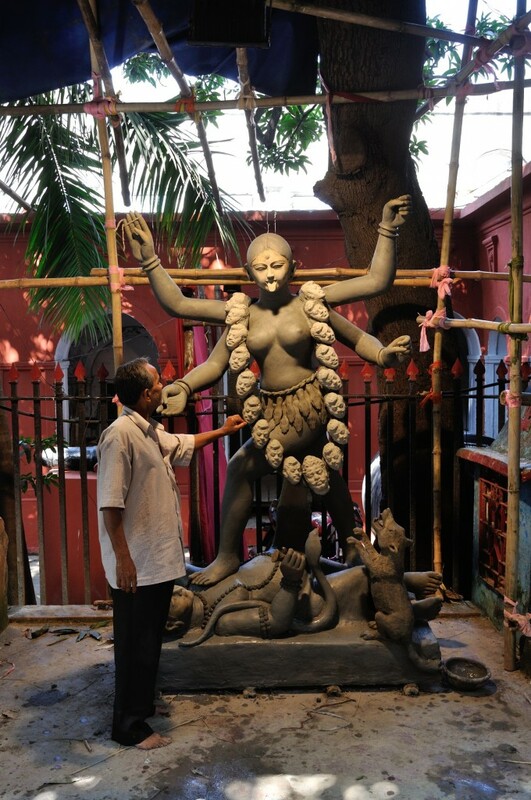 Once the figures of Kali and Shiva had been formed in straw, they moved them to the street outside of the Shovabazar Rajbari, just next to a tiny Shiva shrine. 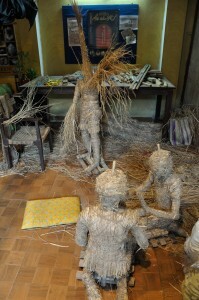 Over the next several days, a bamboo, cloth and paper pandal was built over and around the figures. I enjoyed observing this process immensely, because simply by being present in the situation, I became part of the rhythm of the street. Netal Pal buiilding up Kali’s strand of demon heads. 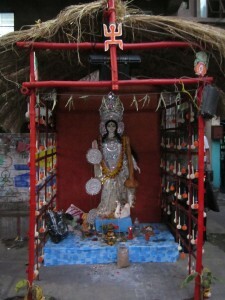 Dilipda’s Kali, now painted and adorned with flowing black tresses. 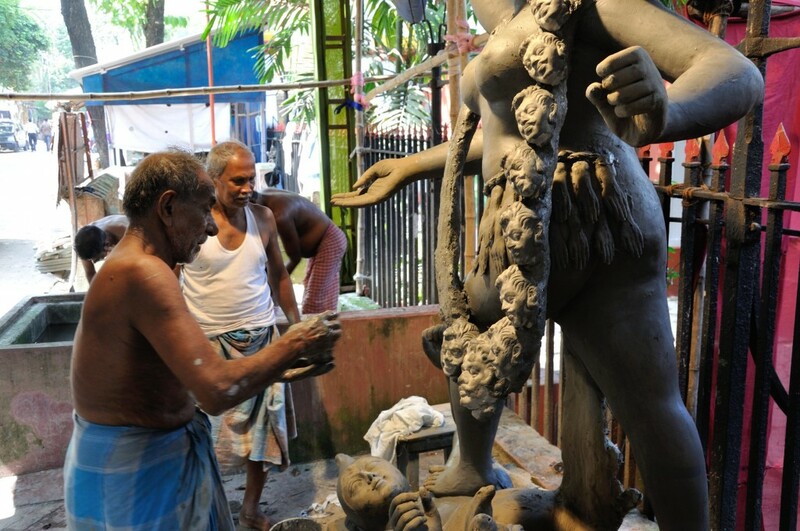 Dilipda completes the final details on Kali’s consort, Lord Shiva. 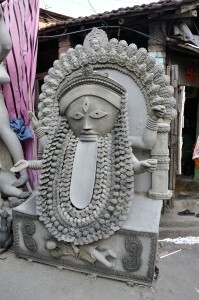 The fabulous Kali figure above stunned me outside another shop in Kumartuli! Kali Ma!